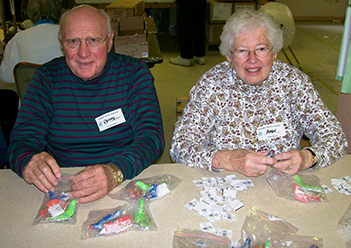 Chuck and Ann Bleakney volunteering at the Brethren Service Center in New Windsor, Maryland (October 2007). 1) Teacher: Chuck spent his life teaching others; he was a beloved teacher for many years at William Penn High School. In his retirement he continued to be interested in young people at Limestone Church. 2) Service: Chuck served as a deacon and as an elder at the Limestone Presbyterian Church; he was elected by the congregation to these church offices that involved ministries of compassion and overseeing the overall work of the church. He was very active in Presbyterian Men, often cooking in their church-wide lunches and suppers as well as participating in their work trips to the Brethren Service Center in New Windsor, Maryland to support the ecumenical relief work of Church World Service. 3) Travel: Chuck encouraged hundreds of people to enjoy seeing new places and learning from them through Chuck’s Travel Club. To continue Chuck’s wonderful legacy, you are invited to support an endowed scholarship to encourage people, especially youth, to go on mission trips that will serve others. The earnings from this endowment will help future generations continue to do what was so important to Chuck—to help people have opportunities to learn by active service to others as they participate in mission and service trips beyond their home and local community. Your tax-deductible gift can help people always remember Chuck Bleakney as a wonderful teacher, servant, a traveler and a friend to all. Check can be made out to “Limestone Presbyterian Church” noting on the check memo line that it is for the “Bleakney Fund,” 3201 Limestone Road, Wilmington, DE 19808. Charles Wesley Bleakney, Jr., son of the late Charles W. Bleakney, Sr., and Elizabeth Vogel Bleakney was born May 7, 1925 and died on Wednesday the 28th of May, 2008. Early on, fishing and hunting at the Bleakney cottage on Pymatuning Lake were near and dear to his heart. Mr. Bleakney attended South Hills High in Pittsburgh. He enlisted in the Marine Corps prior to his graduation and proudly served his country in the South Pacific during WWII. He graduated from Edinboro University, PA and was president of the Theta Chapter of Kappa Delta Phi fraternity. Mr. Bleakney taught at William Penn High and was Chairman of Fine Arts in the Colonial School District. He studied at Haystack Mountain School of Crafts, Liberty and Deer Isle, Maine. He enjoyed a business relationship with Slicers Sporting Goods in Newport. Known as Wes by his immediate family and Chuck by friends, he was an avid traveler and operated Chuck's Travel Club. His club thrived and shared a close association with Uniglobe Red Carpet Travel. He enjoyed his summer home with family and friends in Cape May, NJ for many years. Mr. Bleakney was a member of Limestone Presbyterian Church, where he was an Elder, Deacon and active in the Men's Ministry. He was a member of the American Legion, Veterans of Foreign Wars, Order of the Free and Accepted Masons and Shriners. His family would like to acknowledge the attentive and compassionate care provided to Charles by all at the Helen Graham Cancer Center and the Christiana Medical Center. He was preceded in death by his brothers, Donald E. Bleakney of Fredonia, PA and Raymond W. Bleakney of Hermitage, PA: and his daughter, Leslie Ann Perry of Goffstown, NH. He is survived by his wife of 57 years, Annjeanette and son, David.